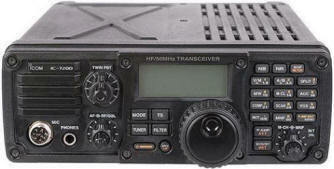 Yaesu FT-1000MP Mark-V Simply the best contesting radio I have ever used or owned. I love big radios, with lots of buttons, dials, and meters. I use this radio mainly for cw. It has a 250 Hz cw filter and a 2 kHz ssb filter in the 2nd and 3rd IFs. The ssb filters are for contesting. I can't say enough good things about this radio. To truly understand, you just have to own one. 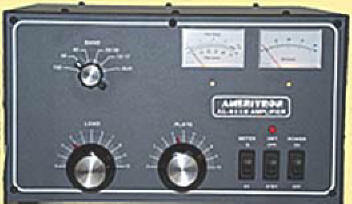 Ameritron AL-811H This little amplifier produces 600 Watts on all bands. The tubes are inexpensive. The amp tunes easily. 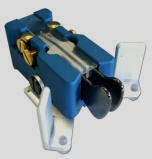 And lets face it, it is the first 600 watts that really make the difference anyway. Ok, so maybe another 900 watts would be great, but I can run this one all day long and not interfere with my neighbors TV. I used the Ameritron Amp buffer to connect the amp to my Mark V.
GAP Titan DX Vertical Antenna This antenna lives up to it's advertisement. 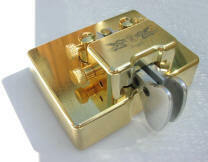 It covers 10 - 40, the WHOLE band with an SWR of 1:1. It works well on 80, with the help of my antenna tuner. Heck, I even loaded it up on 160 for a contest multiplier. GAP Voyager Vertical Antenna This antenna lives up to it's advertisement. I use it for 40, 80, and 160, let the contesting fun begin! Heil Pro-Set Plus Head phones & Boom Mic This is undoubtedly the most comfortable headset I have ever owned. The boom mic has a great sound to it. I liked the set so much that I bought a second pair as a back-up. ACLog by N2FJP This logging software is like having cruise control, it really lets me concentrate on the contact while my computer records all the data. It also imports all of my contest QSOs. Did I mention that it connects with LOTW and eQSL seamlessly? It is the best logging software that I have ever used. Icom IC-V8000 A nice little 75 W 2m FM mobile rig that I use for base operations. My Gap Voyager is now in place and working great. Yes, I had a two Gap station! In the picture on the right, you can see my Titan as well. About 60 feet separates these two wonderful verticals.